These strikingly beautiful stairways will add architectural interest to any custom residential or commercial project. The stainless steel spiral stair can be fabricated to any diameter and style according to the customer's specifications. We use the finest grades of stainless steel on the market. We offer any combination of styles which include all stainless steel or stainless steel with wood treads and landing platform and different handrail systems. Our experience sales staff will be happy to work with you in anyway possible. We also offer blue line drawings, engineer calculations and CAD drawings. The finishes we offer are a #4 brush finish on the stainless steel stair and a bare finish on the wood so the customer can finish on the job site. We also offer a mill finish. 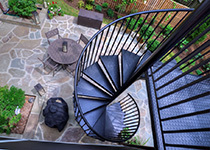 The craftsmen of Stairways, Inc. have years of experience in the art of creative stainless steel spiral stairways. Our impeccable attention to the visual and structural details ensures strength and durability while retaining its grace.